A Queensland man has taken out an international award for his range of colourful and unusual portable toilets. 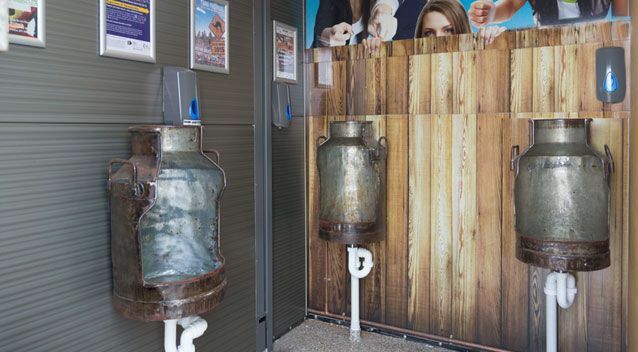 Dunnies with a Difference’s Neville Owers said he has heard his company has won the Quirkiest Toilet Experience award in the inaugural 2017 Internatoinal Toilet Tourism Awards and it all started from something which was “just a bit of a joke” four years ago. His range of portable potties includes a single toilet shaped around a red London phone box, a modular ensuite with a large shower cubicle and a gas hot water system, and a rustic shed toilet. Mr Owers said the rustic shed and the cottage were proving popular for people at weddings. The toilets are made out of recycled materials. Mr Owers said one of the dunnies used recycled timber from palettes for the doors with the vanities made from a shed previously used as an abattoir. He said the company was building more toilets with the new batch running off renewable energy. “We’re still, again going to fit in with the country theme,” he said.